Spacious apartment in a superb central location. 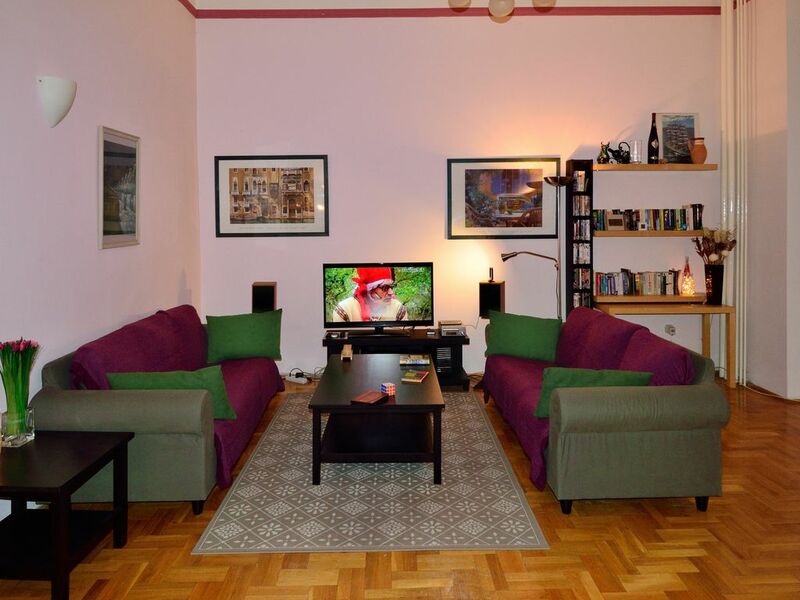 Centrally-located in a quiet area close to the Parliament and River Danube. The Falk Miksa holiday apartment. Spacious 2-bedroom apartment in excellent decorative order. In a quiet street close to the magnificent Parliament Building and River Danube. This is possibly the best residential area on the east side of the river (Pest). - Main room with new high quality 47-inch/119-cm cable TV, Blu-ray DVD player and extensive film library, Denon Hi-Fi. Wood-block floors and loose carpets. Spacious dining area. - Sizeable fully-equipped kitchen/breakfast room with gas hob/oven, top of the range Panasonic combi microwave, 4-place dishwasher. Siemens automatic washing machine. - Two large double bedrooms with wardrobes. - Large working desk with fast Windows 10 PC (with MS Office) and laser printer. - Fast secure wi-fi throughout the apartment. - Five minutes' walk to a good mini-supermarket. - Coffee shops and an upmarket restaurant in Falk Miksa street. - Eight minutes' walk to the nearest subway. - The apartment remains cool in summer and is centrally-heated in winter. - Friendly and helpful local manager always available. British owner. My main concern is that you should enjoy your stay. I recommend this apartment highly! I've been here before and liked its homeliness, welcoming atmosphere, brilliant situation just yards from the Parliament Building. The flat is very comfortable and lacks nothing and the owner and his local manager go to great lengths to make your stay a really good one. I'm so glad I returned. We very much enjoyed our stay at this beautifully spacious and well-equipped apartment, which was a true home from home. The apartment is fantastically located in the 5th district of the city, just 1 minute walk from Parliament building and near the metro stop and tram stops, as well as local supermarkets. It’s also a short walk from Margaret Island, across the bridge, which is a fun place to visit and mingle with the locals on a sunny afternoon. Communication with the owner over keys/transport etc was clear & efficient, and the wine/chocolates waiting on our arrival were a lovely touch. It’s located in a warm apartment building so would be cosy for a winter stay. If you’re looking to be in the very heart of the nightlife you might want to be nearer the 7th district, but we found this to be brilliant for our needs and great value for money. This is a splendid apartment in an excellent location and highly recommended! I spent 19 days in this apartment and would highly recommend it. The host was particularly concerned to make the stay as comfortable and welcoming as possible. Everything was clearly explained and there is a local manager who could arrange travel from the airport if required. All the rooms were very nicely furnished and cosy, too. The kitchen was extremely well equipped. The apartment became very much a 'home from home' and I would like to return there whenever I go back to Budapest. This has been the best place to stay for me by far, and I have stayed in many apartments in Budapest. Thank you very much for the kind words in your review. We do always try to make our guests happy and comfortable. And we couldn’t do it with our fantastic manager Tamás. My wife and I took our 17 year old son to Budapest for our first family visit there and it was a wonderful place to call home for the week. The apartment is a stones throw away from the Parliament building placing you on the northern end of the “touristy” areas of Budapest. The best thing about this is it means you are close to transportation (Trolly line 2 and Metro line 2) getting you out and about town quickly while still having a quite neighborhood to return to and have a nice nights sleep. Groceries and cafes are close as well. For those with issues walking up stairs, there are only a few stairs up to an elevator that can get you to the apartment. The apartment has a fully supplied kitchen, excellent sized bathtub and sit-down shower, and a full sized clothes washing machine. Excellent instructions are left to help you understand how to utilize the different appliances and the 3 remotes you need to watch TV. Of course the only reason to turn on the TV this time was to watch some World Cup action if we didn't feel like going to the public viewing which was in a park only a 5-10 minute walk away. The next time we go to Budapest we hope to be able to stay in this apartment. We highly recommend it. Very large and homey apartment in quiet neighborhood just 2 minutes walk from the Parliament. Complete with everything to make it a real home away-from-home. Hosts Geoff and Tamas keep us posted every steps of the way, also help arrange for pick-up and send-off taxi. Specific and easy-to-follow instructions on all equipment are the best and much appreciated!! Will definitely recommend to others and book again next time we visit Budapest! Superbly located 100m from the beautiful parliament buildings, close to train, tram and supermarkets, nice big rooms, every convenience, this was the perfect place to stay. Geoff is a great host too, leaving us a welcome gift of chocolates and wine. Next time i am in budapest i won't look for accommodation, i will just go straight here. Thank you for your review. We very much appreciate your kind comments. Walk down Váci Utca. It's a sort of pedestrianized mini Bond Street/Fifth Avenue. Make sure not to miss the beautiful covered market at the end of Váci utca. Walk along the Danube if it’s not too cold. Admire the Parliament Building and visit local coffee shops for cappuccino/cake. Make sure you don't miss the Fine Arts Museum at Hosök tere. Or if you're in a more somber mood reflect on events at the Terror Háza (Andrássy út 60). Here you will see 20th century history of Hungary’s oppression under occupying forces. Walk there in 20 min via Oktagon. On route you could shop at the Westend City Center (Teréz körút). It has a reasonable supermarket but do avoid the awful fast food. My favourite other museums are the National Museum (Complete history of Hungary), Jewish Museum/Synagogue, the Postal Museum and the Subway Museum. And before you leave you must see and photograph the Opera house. Better still, book some tickets. Summer and winter rates are £60 and £50 respectively per night for the first 4 nights. Subsequent nights are charged at £36 per night. There are absolutely no additional charges and I won't charge you for local telephone calls. Earliest arrival time is officially 1600 hrs. Latest checkout 1100 hrs. However, we can usually be flexible, but please ask. Please ask me about discounts for rentals of seven nights or more.